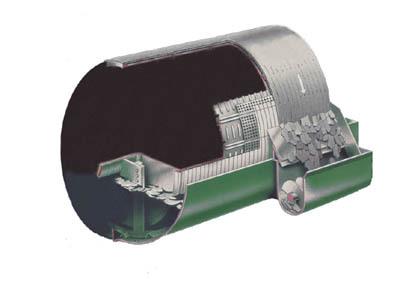 The vacuum is created inside the drum which spins around. Thus, in the submerged part of the drum, a quantity of water and suspended matter is sucked onto the screen. Then in the emergent part of the drum, the water is sucked into the cavity whilst the suspended matter is held up on the screen. The sludge is thus separated from its liquid phase, thereby obtaining a dewatered sludge. At each rotation, this dewatered sludge found trapped at the surface of the screen must be removed. For this, a scraper blade placed along the length of the drum removes the layer of sludge, which is then sent into a skip. – Reduction in consumption of filter aid (up to 50% compared with standard additives). – Reducing SS, COD and BOD.